During your visit to the cathedral, you will learn about the cathedral’s touching history as well as the most important works of art that were created for the cathedral, especially in the Middle Ages but also over the centuries. Enjoy St. Stephen’s wonderful interior with all its fascinating architectural details. With the audio guide, you get all the important information about the history of the cathedral church and its works of art. You will receive a map showing the different stations. The audio guide is available in 23 languages. Borrowing an audio guide in your required language is already included in All-Inclusive Tickets. A cathedral guide shows you the most important sights of the cathedral and is available to answer your questions. Please note that for liturgical or organisational reasons, guided tours may not take place, for which we ask your understanding in advance. The blue dot indicates the meeting place for a tour of the cathedral with a cathedral guide. You will be picked up from there at the start of each tour. 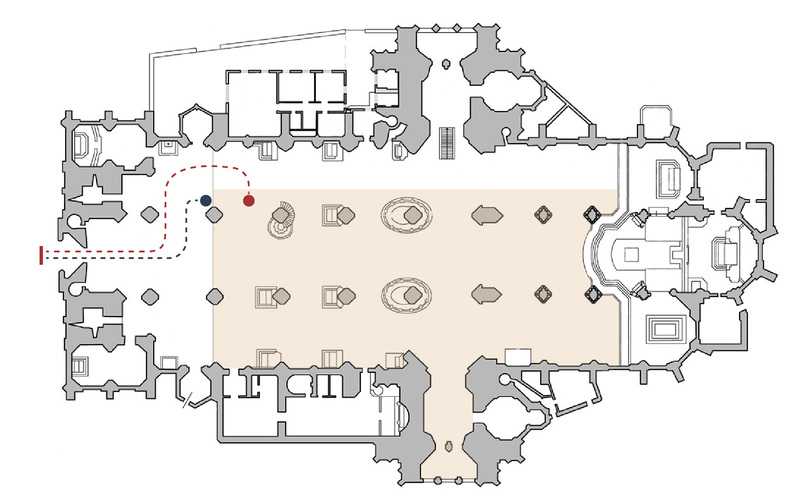 At the red dot you will find the ticket counter for independent visits to the cathedral and the rental of audio guides.